We have had record breaking high temperatures. I have talked to many growers who have been here all their lives and they say there has never been this many days in a row over 80 degrees in March or even April. Yesterday was the 14th straight day over 80, three days were over 90. Today has started out overcast so we may not reach 80 this time. My estimate is that we are at least three weeks ahead of normal. We could be harvesting Zinfandel in August. Some shoots are out several inches, but I need a few more days to predict the potential crop level. I expect we will have a below normal harvest. Later this week we will be sending e-mails and postcards announcing our 2004 pre-harvest futures offer. As I have said, our prices have remained the same and the Aca Modot and the Block 4 will be down in price for a short time. If you are up to purchasing wine at below wholesale prices, this is your chance. You will not find prices this low for Dry Creek Valley wines. On April first the Futures for our 2003 wines (not to be confused with our 2004 pre-harvest futures) will be raised by one dollar. These 2003 red wines will be bottled in the first and second week in July. Our 2003 Sauvignon Blanc will be bottled in the first week in April. Our temperatures have finally come down to normal and we do welcome this. I just went out to the vineyard and took another look at the vines to evaluate the crop level. It is still a little early, but I can say that I don't see the potential for over cropping. Some vines have one to two bunches per shoot which is normal. I don't want a big crop, because I don't have to produce as many cases as the last two years. While driving down North Fitch Mountain Road Friday night March 19th my 16 year old daughter had a blow-out. As most of you know there is a sharp turn that has been the site of numerous accidents. 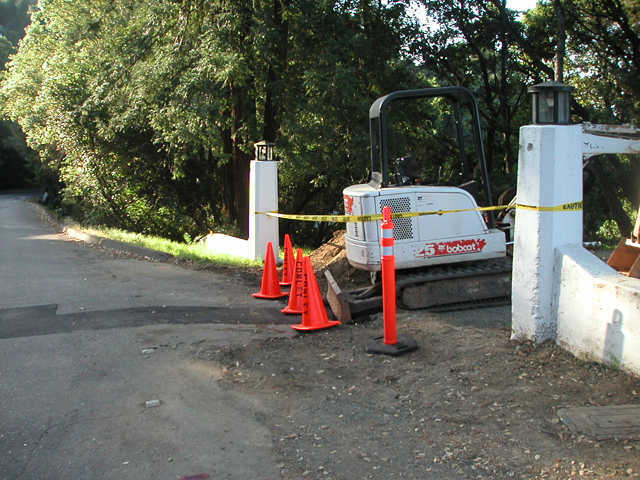 This time there was a backhoe parked on the worst part of the turn with the blade sticking out. Her wheel struck the blade which caused the rims and the frame to be bent and a 6 inch gash in her tire. She gathered control of the car, but she could have been killed. I am obviously very concerned about the conditions at that turn. Why was such a hazardous piece of equipment sitting so close to the road? And why is there loose gravel and sand on the shoulder? I feel all of us should take action to avoid the possibility of another serious accident. I strongly recommend that Healdsburg make a study on how to improve this section of City property. On Friday night of March 19th at approximately 11:30 pm I left the Villa and headed down towards Powell Ave. It was very dark and there were cars both in front of me and in back of me. When I came to the sharp turn not far down the road I noticed the �15 mph� sign and slowed down considerably. I was not aware that the turn was so long and about halfway through the rest of the road is blocked by a hill and what is seen is a driveway straight ahead that is surrounded by a white wall which stands out more than anything else on the road. 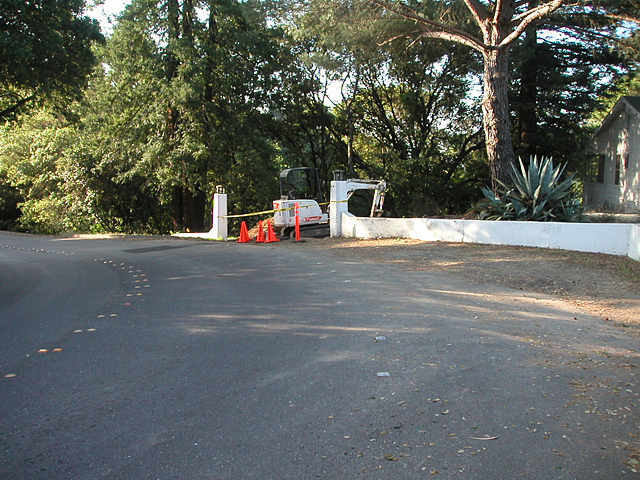 The position of the hill and the driveway give the illusion that the curve is straightening out and that the direction of the driveway is the way the car should go. Once it is realized that the turn in fact does continue on in the tight curve, there is just enough time to correct the path of driving. That night I did notice the neon cones and as I was coming around the turn on the shoulder (because of the previous information given) I quickly steered away from them, but I felt the car swerve on the loose dirt that was on the side of the road. What happened next was too quick for me to fully remember, but I do recall feeling a heaving impact to the right side of the car and hearing a loud bang, which I later found was from the tire being blown out. I immediately turned away from the shoulder and the car swerved into the opposite side of the road. Luckily I was able to gain control of the car and drive safely to where I was meeting my friends. As you will see the backhoe was in a very bad spot and the owner Dale Conley said he had the right to have the backhoe there, because he was within the law and everyone is on his side. The cost of my repair was over $1500 and I have no intention to present it to my insurance company or ask him to pay for any of the repair. I just feel people should be more careful of creating situations that could contribute to serious accidents whether they are within the law or not. The City and Dale Conley feel differently. There are no white lines or reflectors on the worst turn in Healdsburg and I plan on changing that situation, but I have not got a commitment from Dale Conley to be more careful. I am so excited! There will be big changes on our property in the next two days. Right now contractors are coming in to widen our driveway so that trucks can get in here easier and customers will be able to see our sign and entryway more readily. We will be moving our sign to a location closer to the road. Two weeks ago we cut down a few trees near the entryway to increase the visibility both ways. We expect to attract more potential wine buyers in the future. "Tannat is best known as the dominant grape variety in Madiran, Southwest France's most famous red wine. The grape probably originated in the Basque country and almost certainly derives its French name from its high tannin levels. It is a thick-skinned grape variety that produces deeply coloured, well-structured wines that can be tough and austere in youth. However with ageing the massive tannins round out while the wine develops nuances of spices, coffee, cocoa, and vanilla. In Madiran it is blended (typically 60-70%) with Cabernet Sauvignon, Cabernet Franc, and Fer. The only other country where Tannat is seriously grown is Uruguay, where it was planted by Basque settlers in the 19th century. It is known as Harriague in Uruguay and recently plantings have spread over the border into Argentina." And here is a link to a great site describing some of the recent developments with this grape. 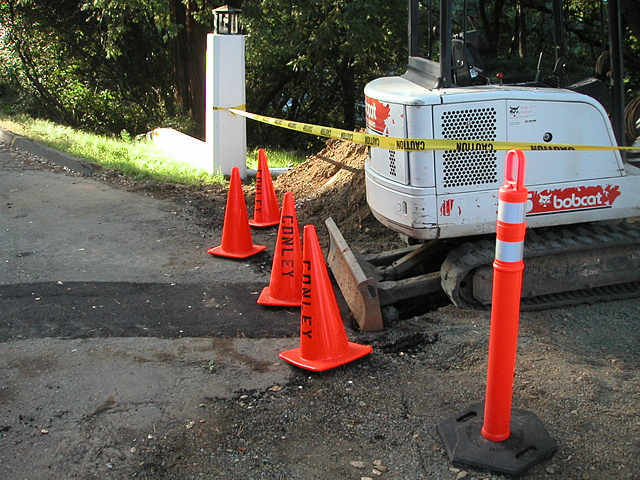 Possibly the most exciting thing today could be the installation of a new high speed internet connection. We have been using Starband for the last few years and it was a good improvement from dial-up. Our download speed was up to 400 Kbps, BUT our upload speed was usually only 15 Kbps. There is a tower up on Fitch mountain and a local company, Vista Networks, has relayed a signal out to me. They are now trying to decide whether to relay from my site up the valley further. I will have speeds of 768 Kbps up and down. I can't wait! !